Watch propertybuyer's April Market Update here, or read below. Bank finance is the oil in the property machine. When credit is rationed the machine should slow down – or at least that is the theory. APRA (the Australian Prudential Regulation Authority) first announced a 10% limit on bank lending to investors in December 2014. Why is APRA doing this? The current proportion of investor lending for interest-only loans is around 40% and APRA want this reduced to 30%. The reason APRA is introducing these changes is that they believe the Sydney and Melbourne property markets need to cool rapidly. Housing prices have accelerated by over in 77% Sydney and 57% in Melbourne over the last 5 years since the boom started according to Corelogic. Household income has only risen marginally over the same period, but thankfully the job market has been strong and unemployment is now at 5.9% and inflation very low at just 1.5%. Record low interest rates have encouraged home borrowers to take out larger mortgages and investors to capitalise on equity growth and buy more properties. Overseas capital has also seen Australia as a safe haven for investing in both residential and commercial real estate. The RBA is hamstrung from raising interest rates too quickly to quell demand in Sydney and Melbourne at the expense of the rest of Australia where there is no property boom. APRA want to see a more orderly transition in the property market and have given the green light for banks to raise rates independently of the RBA. What is the impact on investors and home buyers? Overall I support the changes implemented by ARPA as it creates more stability in the property market. Ever since the GFC, banking regulations and lending criteria have been tightened and we have some of the best quality loan books in the world. Reducing speculative investors from the market creates more confidence and means there is less chance of a crash or dramatic slowdown in the property market. I foresee these changes will see investor lending tapper off a little. It means that there could be a few less investor bidders at your next auction. And it is a positive thing for home buyers as the proportion of home buyer lending is likely to increase. While the changes make it perhaps a little harder to get finance, the banks will still be lending money for investors. And there are plenty of non-bank lenders that fall outside APRA’s guidelines that are offering competitive loan rates for investors. The good news is that official interest rates are likely to stay very low for a long time but banks may raise rates on investor interest only loans separately (meaning that bank shareholders will profit nicely). I get asked every week if now is a good time to buy…well the best time to buy was 10 years ago. But that opportunity has now passed so the next best time is simply when you can afford to buy. Borrowing capacity is likely to be further squeezed in the future, so the sooner you can qualify for a loan and get into the right markets the better off you will be. If you don’t qualify for a standard bank loan, you could consider getting a loan with a non-bank lender for a few years, perhaps pay a slightly higher rate, then refinance to a major lender in 2 years time. I highly recommend you speak to a savvy mortgage broker that understands the new lending criteria. If you would like a warm introduction to our preferred finance brokers please contact us. If you are an investor, then don’t “speculate” and don’t follow the herd. Invest for the long term in property and research properties that you believe will outperform the average. Pick “investment grade” properties that have the right fundamentals for growth. High quality properties rarely fall in value. You are better off paying fair market value than waiting for an elusive market fall. If you are a home buyer, then don’t let external media forces tell you what to do. Find a home that meets your needs for the future, research and negotiate it well. If you need a hand with any part of the process we are here to help. If you have an existing pre-approval that is about to expire and want to buy quickly- we can act fast to find a property. We get access to many pre-market listings and off- market opportunities. To get your property plans on track for 2017, please call us on 1300 655 615 or send us your wishlist today and we’d be delighted to help. 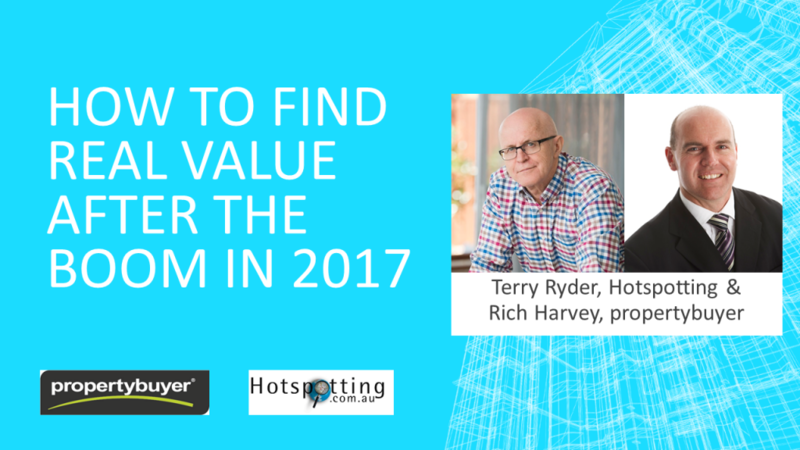 We are very excited to have a very special guest, Terry Ryder from hotspotting.com.au at our first webinar for 2017! In this webinar, we look at how investors can find the best value properties in the market now that the boom is likely to subside in Sydney and Melbourne. Investors can't buy and hope as a strategy, you need to be very deliberate in identifying pockets of value that deliver both high growth and high yield. Register your interest to watch webinar here.